“It can’t happen here.” It seems this is what we are supposed to believe: no nuclear accident can or will happen here. FACT: Nuclear emissions happen routinely at all nuclear facilities, and a nuclear accident can happen at any nuclear plant, anywhere. This quotation illuminates the situation well: “Fukushima happened in a country which is probably the most rigorous, in terms of technology, in terms of scientific care, in terms of an accountability system. And if it can happen in Japan, Fukushimas can happen anywhere. The point about nuclear is that accidents don’t happen in any nuclear power plant because of the calculation about your fission material. They happen because a generator stops. They happen because a cooling tower stops. They happen because of small mechanical failures which you can’t predict. But in the case of nuclear, which is a stupid technology because all you’re doing is creating fissionable material, creating radioactive material, using radioactive material, to boil water. The power doesn’t come from nuclear, the power comes from the water. Now, there are safer ways to boil water.” – Vandana Shiva, Ph. D., philosopher, world-renowned environmental thinker, activist, physicist, feminist, philosopher of science, writer and science policy advocate. Nuclear power is cheap and represents the best deal financially. FACT: The actual costs of nuclear energy are consistently misrepresented, incomplete and externalized. Nuclear power cannot be sustained without huge government subsidies and handouts from all levels of government. It was once said that “nuclear would be too cheap to meter,” but it has turned out instead to be a very dangerous boondoggle. 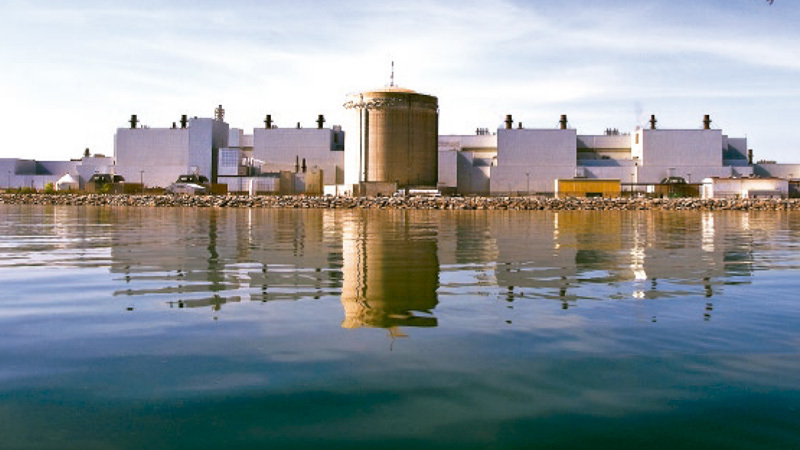 Ontarians are still paying the stranded debt for nuclear projects built decades ago. Who will pay for the waste, accidents and decommissioning in the decades ahead? Today, renewables and efficiency are much cheaper than nuclear. Cost comparison: energy efficiency: 3.5 cents per kilowatt-hour; water power imports from Quebec: 6 cents; wind: 6.3 cents; nuclear: 8-15 cents. Source. We need nuclear energy to keep the lights on. FACT: That’s what Japan said too, until they shut down 50 of their 52 reactors (post-Fukushima), and surprise – the lights stayed on! We still have huge untapped energy efficiency potential. Hydro power, wind power and bio-energy are all lower cost and lower risk sources of electricity than nuclear. Quebec has phased out nuclear power and Belgium, Germany and Switzerland are all working toward a nuclear phase-out – we can too! The nuclear industry is carefully regulated by “arm’s length” regulators who work hard to ensure the safety of all citizens. FACT: Nuclear “regulators” are really essentially licence-granting bodies that almost invariably grant the requested licences to the nuclear industry proponent requesting them. It has been said many times (and by many people) that the Canadian Nuclear Safety Commission (CNSC) is far “more of a lapdog than a watchdog.” This is a global pattern. The nuclear industry is very scientific and always relies on good solid peer-reviewed science. FACT: It is actually quite surprising how un-scientific the language one hears being used by the industry. Spills are always said to be “small.” Risks are always said to be “acceptable.” Exposures are invariably “below regulatory limits” and proposed activities are invariably “not likely to cause significant adverse environmental effects” (even though such statements are never in any way substantiated). We can trust the nuclear industry to tell the public about releases, spills, regulations, and safe transport of nuclear wastes. FACT: The industry often delays informing the public about spills, at most eventually posting a short notice on an obscure Web site. Releases to air and water, though occurring routinely, are never admitted. Categorization of nuclear wastes is done by the industry itself. Low-level, for example, does not mean low risk. Increasingly, with quiet changes in regulations being enacted behind the scenes, wastes are buried in regular landfill sites or incinerated. Wastes are also subject to increasing transport, with neither the knowledge nor the consent of the public. This promises to become an ever-more significant issue/challenge/problem as time rolls on. Nuclear waste is kept safely segregated from the public. FACT: Nuclear waste is now being found in consumer goods! Even the International Atomic Energy Agency (IAEA), which exists to both regulate and promote the nuclear industry, admits there is a problem with this. Nuclear energy has no negative impacts on human health. FACT: Nuclear energy imposes risks all along the nuclear fuel chain, from mining to milling, refining, processing, fissioning, waste storage and ultimate disposal. There is no safe level of exposure to ionizing radiation – internal exposure can be far worse than external, as it is localized and therefore more likely to impact DNA directly, causing mutations etc. Ionizing radiation causes harmful effects because it is genotoxic – it damages DNA at the cellular level. Low doses can have significant long-term genetic consequences, causing genetic instability and resulting in an increased risk of cancer, lymphoma and leukemia for the individual exposed, and heritable damage as well. Most people are not aware of a decades-old deal between the global nuclear promoter & the global "health" agency. Best check it out! The nuclear industry is very close to having a solution for its 70-year accumulation of nuclear wastes.The industry has actually made little or no progress in this regard. (For decades, several countries have been pursuing the option of burying high-level nuclear fuel waste, but no country has done it. Numerous technical and scientific issues related to the long-term safety of deep geological repositories remain unsolved.) The nuclear industry, however, continues to spend hundreds of millions of taxpayers’ dollars (handed to them by our governments) to pursue plans that have almost zero chance of success (i.e., to successfully contain the radioactive wastes destined to be greatly dangerous for 100s of thousands of years … or even longer), and they will spend tens of billions more if their nuclear burial schemes are approved. A little-known fact is that we, the public, actually own the waste that the nuclear companies have generated, which is to say that (in Ontario), Ontario Power Generation owns it, and we the taxpayers thus ultimately do. The existence of the NWMO (Nuclear Waste Management Organization, a creation of the Canadian nuclear industry – not an independent government agency, as many suppose) can be seen, then, as essentially a PR exercise allowing the industry to continue creating more waste, while claiming to have solved – or to be diligently at work solving – the nuclear waste problem. The nuclear industry has careful, well-thought-out plans for the eventual decommissioning of its various facilities. FACT: The industry still has quite limited experience in the decommissioning of reactors and other nuclear facilities. Decommissioning is shockingly expensive and time-consuming, and it appears the industry is still just basically experimenting with it. As well, the justification for waiting such long periods of time before doing decommissioning is neither convincing nor justified. In reality, the industry is just "kicking the can down the road" in order to avoid those high costs in the present. Decommissioning is not profitable; selling electricity is. Prepare to be shocked in the days ahead at both the costs incurred & the wastes to be produced during decommissioning. There is no connection between the operation of nuclear plants and the creation of nuclear weapons. FACT: These two things are intimately inter-connected. Nuclear power plants are atomic bomb factories because they produce plutonium and other by-products that are essential ingredients of nuclear bombs. Any country with a nuclear reactor can in theory produce a nuclear weapon. CANDU reactors produce the isotope Plutonium 239, making the production of nuclear weapons relatively easy for host countries. India manufactured nuclear weapons from Canadian nuclear technology in 1974. As well, depleted uranium is a by-product of the uranium enrichment process and is used in weaponry, including nuclear weapons. Tritium, a by-product of CANDU nuclear reactors, is radioactive hydrogen. The weapons connection is that tritium is the ‘H’ in the H-bomb. As tritium has a relatively fast half-life of just 12.3 years, fresh supplies of tritium are essential to top up and maintain thermonuclear warheads. Tritium shortages are a serious matter for nuclear weapons states. Export of OPG (Ontario Power Generation) tritium needs to be more strictly controlled. We can trust our governments and the nuclear industry to consider our best interests concerning the creation of energy, the “fallout” from its creation, in terms of environmental and financial impacts, and consequences of a nuclear accident. FACT: We cannot trust them at all! Our governments allocate our tax dollars to the nuclear industry irresponsibly and do not require the industry to pay its own way – either on a day-to-day basis, or in the case of potential accidents. Nor is anything close to sufficient planning done for possible emergencies. Finally, the nuclear industry is only required to pay $75 million maximum in the event of a nuclear accident. If the industry really trusted itself, and if our governments really trusted it, wouldn’t it be reasonable to remove this cap and expect the industry to fully pay its own way? Nuclear refurbishment & also here. Also: Alpha Contamination at Bruce Refurb.